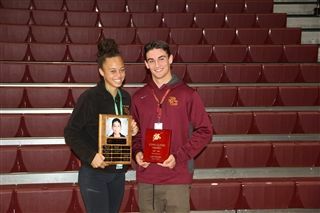 At the annual Heroes Assembly on Nov. 14, Salpointe recognized two students as heroes at Salpointe for their humility, kindness, and perseverance. We remembered Carlos Valencia ’06, a young man of compassion, love, generosity, and simple living. Carlos fought against Leukemia and encouraged over 6000 people to become bone marrow donors. 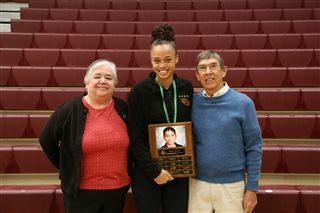 The Carlos Valencia Humanitarian Award this year was given to Iasia Ratliffe '20 for her perseverance, positive attitude, and loyalty. We also remembered John Glinski '68 who was a tremendous student-athlete but suffered from cancer. 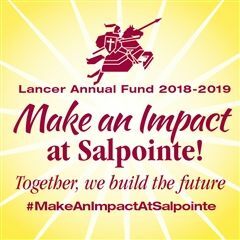 Between surgeries and recoveries, John continued to play four sports at Salpointe with great courage and strength before he passed away in 1966. 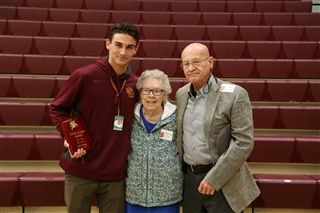 Embodying the spirit of John Glinski, Luke Regina '20 was this year's recipient of the John Glinski Award. Luke is a quality student and a team player. 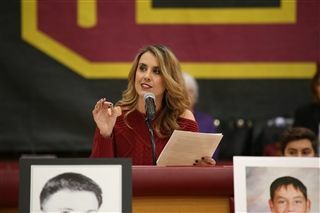 Kimmi Romo '99 was the speaker at the Heroes Assembly. She shared examples of the everyday heroes "who commit their lives to serving others," Kimmi said. "Yes, oftentimes we find heroes dressed in uniform…but we can also find them in our everyday lives. They are the people we are rubbing shoulders with every single day. People who are shaping our lives – whether they know it or not." She recalled heroes in her life including her husband who is a firefighter, her coworkers who provide physical rehabilitation for trauma victims, and even her grandparents. "My grandparents who had nothing – found a way to get an education – pulled themselves up by their bootstraps, and made a nice life possible through grit and tons of hard work." We are surrounded by heroes who impact our lives every day, but we can also be heroes to others every day by being a good person. "Who are the heroes in your life? Thank them. Today. And be that person for somebody else."